​I set my goal, and it was a big one. I wanted to create a Leader’s Guide to accompany my newly-released book. Even when I started writing the book, I knew it would one day be used by women to dive deeper into God’s Word through group study. Still, seeing this new goal through to the end would take extreme focus and a heaping dose of determination. Summer proved to be the perfect time for such a huge assignment. Taking an out-of-town sabbatical would give me just the quiet study time I would need. I didn’t know, however, that God had other plans. Different things happened to interrupt my well-laid-out schedule. Company came, and I felt a strong nudge from God to lay down my fancy organizer and enjoy precious time making memories with loved-ones. Then after our fun-filled visit – a frightening interruption. One that would eventually send me to the hospital and leave me unable to do anything for several weeks. My goal to do this great thing for God came to a screeching halt. Instead, the lofty dream faded. Now I just longed to do simple things, like take a walk down my street again. Cook dinner for my family again. Feel like myself again. But healing was slow going, and summer soon came to an end. During that time, I watched many of my friends racing along at warp speed, accomplishing one great thing after another. Before I knew it, I began comparing my pace with theirs. I seemed to be moving like a snail compared to them. And so, I considered letting go of my dream all together. Then God reminded me of the very words He gave me for the Faith Statement in chapter 4 of the Over It book. 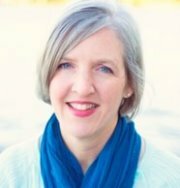 ​I realized these interruptions in my life gave me exactly what I needed – time to reflect on why I wanted to write the Leader’s Guide in the first place. Was I doing it to show others what I can accomplish? Was I doing it to show God what I can accomplish? Maybe my focus became skewed somewhere in all that striving. Thankfully, God is there to intervene when my focus wanders from Him and His plan. Because as long as I keep my eyes on God, He will set my pace. ​When we keep God at the center of our goals, we can see life’s interruptions as opportunities to draw closer to Him. Though struggles may overwhelm us, let’s choose to rely on Him. And when we think someone else may be moving at a faster rate, we can remember the truth of the verse above. Will you join me in praising God today? The Over It Leader’s Guide may be postponed for now, but I’ve learned to trust God’s timing above my own. 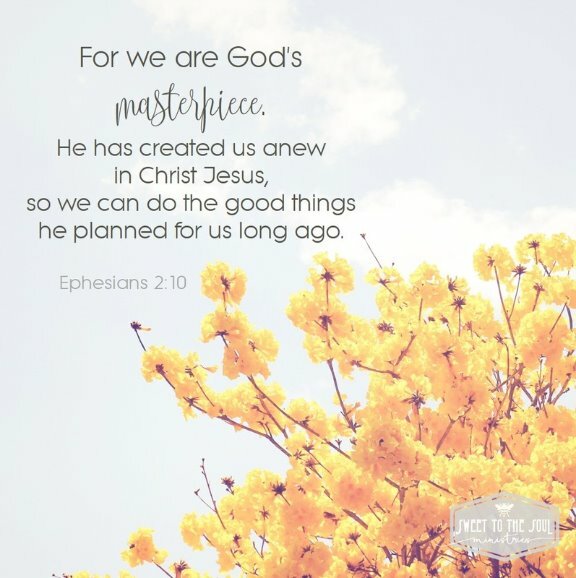 God’s plans are better than any schedule we can create. And as we keep our focus on Him, He will guide our every step. ​Interested in learning more about Over It. 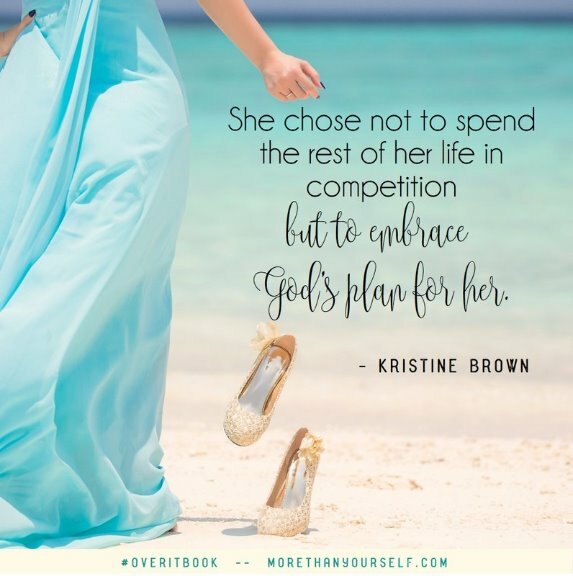 Conquering Comparison to Live Out God’s Plan? Visit the book page here to find fun graphics, tweets, and a link to purchase your copy. 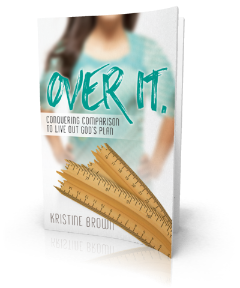 Over It is available in print or Kindle e-book version. A portion of the proceeds from the sale of each book directly benefit the More Than Yourself, Inc. college scholarship program for junior high girls. Click here to see last year’s scholarship recipients. This year’s contest is now open! Winners of the 2016/17 scholarships will be announced in March. You can read more from her at http://www.morethanyourself.com. Love the reminder, Kristine! So encouraging to me right now. I always make certain anything on the stove is off - the phone buried under towels etc. when I see one of your e-mails in my in-box! Ha - I want no interruptions! Then I dive right in and I am always blessed and satisfied to have had your insights and experiences to help me to get a little closer to God. As always, thank you, and many blessings to you! "Thankfully, God is there to intervene when my focus wanders from Him and His plan. Because as long as I keep my eyes on God, He will set my pace." Love this (don't love that you've had such a summer, though). Thank you for this reminder that the pauses are God's way of reminding us to trust Him and His plans (not ours). Thanks so much for sharing with us today Kristine! I love this: "deciding to praise God instead os striving to please others" WOW.... powerful powerful! My daughter and I were just talking about this verse and its application! What a summer friend. What a gift of grace to yourself. I can't wait to see why God's timing on this has been different from yours. Ooooo...I'm praising God right alongside you, friend. What a beautiful gal He has made you - in so many ways. Jana, thank you sharing space for Kristine's encouraging words today. Kristi, isn't Kristine such a blessing? So glad you were encouraged by her words. This is so beautiful, Kristine. Speaks volumes to me right now. I also had planned to release a freebie eshort for my blog subscribers this October, and like you had SO MANY THINGS come up this summer and early fall. Just not God's plan for me. Thanks for the encouragement. Love this beautiful story. I don't love you were sick, but I do know God has BIG plans for you my friend. I've been stifled too, and can't seem to find time or the will to get back to a book I started a long time ago. Praising God for you and your book, and can't wait to see your study guide. HUGS! Oh, Kristine, I hate that you had a rough summer, but at least you had a good reason for not accomplishing your goal! I set the goal, break it into smaller portions, and then just don't do it! I'll admit, there are times I shove my to do list aside because I sense He wants me elsewhere. But...overall...I procrastinate! Thanks for this beautiful post, friend!